Ninds Farm Cottage was once part of the much larger Ninds Farm House. Dating from the later 17th Century, this private wing of the farmhouse had become unfashionable by the end of the 18th century and was partitioned off to form a separate cottage and a curved stair turret was added at the back to allow access to the upper floor. A smaller fireplace was inserted into the original one in the sitting room and the large single bedroom was partitioned into two; the horsehair and lime plaster partitions still remain although the back room now forms the bathroom. Many other original features remain and the present owner has left much untouched while providing a warm and comfortable holiday retreat. Willersey is a small, pretty village, friendly and lively with local amenities including two churches, two pubs serving good food, garage, and shop, and a village pond. Both pubs are dog friendly and excellent walking country is on the doorstep. The iconic village of Broadway is one and half miles away, with its galleries, restaurants and shops. A variety of landscapes surround the village as it is an excellent base from which to explore north Cotswolds towns such as Bourton-on-the-Water, Stow-on-the-Wold, Burford, Chipping Campden and Moreton-in-Marsh as well as the smaller villages which have inspired writers like Laurie Lee and J.M. Barrie. Shakespeare’s Warwickshire is also easily and quickly accessible as is the Vale of Evesham. The Cottage is a short journey from Cheltenham and its race course making it an ideal spot to stay in Gold Cup Week. Worcester is less than an hour away and the 3Choirs Festival is there this July. The Ninds Farm Cottage page on Facebook has some ideas of places to go and what’s on locally and also some links to websites guests might find interesting. It is always work in progress. A comfortable Parker Knoll settee, comfy chair, and two joint stools and refectory table made for the cottage by Welsh furniture maker Haddon Gardiner, provide a place to sit, eat or relax in front of the television and the open fire. The television has Freeview TV and a DVD player. Compact but well-equipped, with electric cooker, microwave, and fridge with freezer box. An iron and ironing board are provided. Larder. A table and two chairs allow a light space for summer breakfasts and a cool floor for hot doggies. The downstairs toilet is accessed from the conservatory as is the small enclosed yard. A small rockery, garden table and chairs, and the wood store. With cupboard containing vacuum cleaner, clothes-airer, and additional blankets and pillows. Switch for the water heater. Washbasin, toilet, and bath with hand-held shower over. Double bed, chest of drawers, wardrobe, two nursing chairs and a charming window seat to the front of the house. On-street parking at the front of the cottage. The main heating is by electric storage heater and electricity is included in the price. There are also two convector heaters should you need them. There is fuel for the open fire to get you started and more. Further supplies are available for purchase at local shops and garages. A bottle of wine is provided, pepper and salt, toilet paper and a pint of milk on arrival if requested. A packet of ground coffee is provided for bookings of a week or more. Bubble bath is provided to get you started too. Liquid soap made by local soap maker The Little Soap Company. Bedding is provided (two sheets, duvet and cover, four pillows and pillow-cases, with extra pillows and blankets in the landing cupboard). There are four hand towels, four bath towels, two hand towels downstairs and two tea towels. Changes of towels and bedlinen will be provided for lettings of more than a week. Up to two dogs are allowed and there is no extra charge for them but please do not allow them on the soft furnishings. Guests are asked to note that there is no washing machine or dishwasher and there is no stand-under shower, due to the constrictions of the age of the building. Mobile phone signal is variable depending on provider and there is no wi-fi at the cottage. The village café and the pubs have wi-fi which is available to customers. Rentals are from 2pm on the day of arrival until 10am on day of departure unless otherwise agreed beforehand. For legal and practical reasons the cottage is not available for lets longer than 30 days. I have a website www.nindsfarmcottage.co.uk where terms and conditions are set out and guests are deemed to have read and accepted these on booking. I bought the cottage in September 2012 as part of a lifelong interest in England’s history and architectural heritage. I have been involved in promoting the Vale of Evesham’s history in other ways previously and the cottage gives me a new opportunity to share the heritage of the area in another, more intimate, way. I did a little work to the cottage to make it cosy but think it important to retain as much of the old fabric as possible, so that the cottage is still allowed to tell its story. This is the only cottage I let, so it isn’t part of a large concern. I live in the next village, (although I now work in Birmingham), and have a strong connection to the locality. My aim is to provide a comfortable and inspiring place from which to explore the Vale and the North Cotswolds. I bought a property in Willersey because I believe in being hands-on with the property and being part of the local economy. I live less than two miles away and so could walk there if necessary. Willersey is a lovely village too without being over-commercialised, although that sort of thing isn't too far away. Electric Storage heating. The settings can be altered to suit guests' requirements. Supplementary heating by two convector heaters (please turn off when not needed) and the open fire. Sheets (top and bottom) and pillowcases changed at changeover. Duvet covers also supplied. Extra pillows and blankets are available. Open fire in lounge. Logs, kindling, firelighters supplied. One scuttle of coal also included. Road outside the cottage, in neighbouring streets, or at the village hall. 4 bath and 4 hand towels per letting, plus 1 hand towel in each of the kitchen and downstairs toilet. Tea towels, dish cloth and oven gloves supplied. The lounge has comfortable seating, freeview TV and furniture by Welsh furniture makers Haddon Gardiner, and an open fire (logs and a scuttle of coal supplied). Modern and basic, not a combination cooker. There is a pantry where the fridge is, and a few shelves for food items. Crockery and glassware supplied for up to four place-settings. Plenty of cutlery and cooking utensils. Kitchen with range of units, electric cooker, microwave oven, iron and ironing board, and fridge. Please note that there is no dishwasher or washing machine. Two places suitable to eat. Either the Haddon Gardiner Oak refectory table in the main room or the table in the conservatory. DVDs are not supplied but guests are welcome to bring their own. Small yard with table and chairs and log store. Outside bin. Notes on accommodation: Heating is by electric storage heaters and electricity is included. The grate in the lounge may be used for an open fire and logs and a scuttle of coal is supplied. Supplementary heating available by way of convector heaters. Parking is available on Church Street, which is a public road or at the Village Hall. Guests may bring two small dogs by prior arrangement but pets should not be allowed on the furniture except on their own pet blanket. Guests should note that there are some low beams in the property. Hairdryer is provided. Outside: Small outside seating area with patio table and chairs Utility Room: None Cleaning / Towels / Linen / Maid service: Change over day is Saturday for weekly lets but other requirements will be considered on request. Bedlinen and towels are provided and changed at change-over. Other: Conservatory/dining area overlooking the outside seating area. The cottage is approximately 40 miles from Birmingham airport. The use of a car would be the most convenient way to explore the area, but Willersey has a good bus service for access to Evesham, Broadway, Cheltenham and Stratford-on-Avon. www.escapetothecotswolds.org.uk is a good starting point for bus timetables. The surrounding area provides many opportunities for all types of interests. Historical sites nearby include Broadway Tower, Hailes Abbey, Sudeley Castle, Evesham's Almonry Museum and historic battlefield, the Shakespeare houses of Stratford-on-Avon. Hidcote Manor Garden is also very close. Local Cotswold villages, both small and large, provide a wealth of vernacular and ecclesiastical architecture. Willersey has its own village shop but larger supermarkets are close-by in Broadway and Evesham. Cheltenham and Stratford are larger towns with extensive retail opportunities. The cottage is an ideal location for those going to Cheltenham races, Broadway Golf Club, walking on the Cotswold way or exploring the many other footpaths. 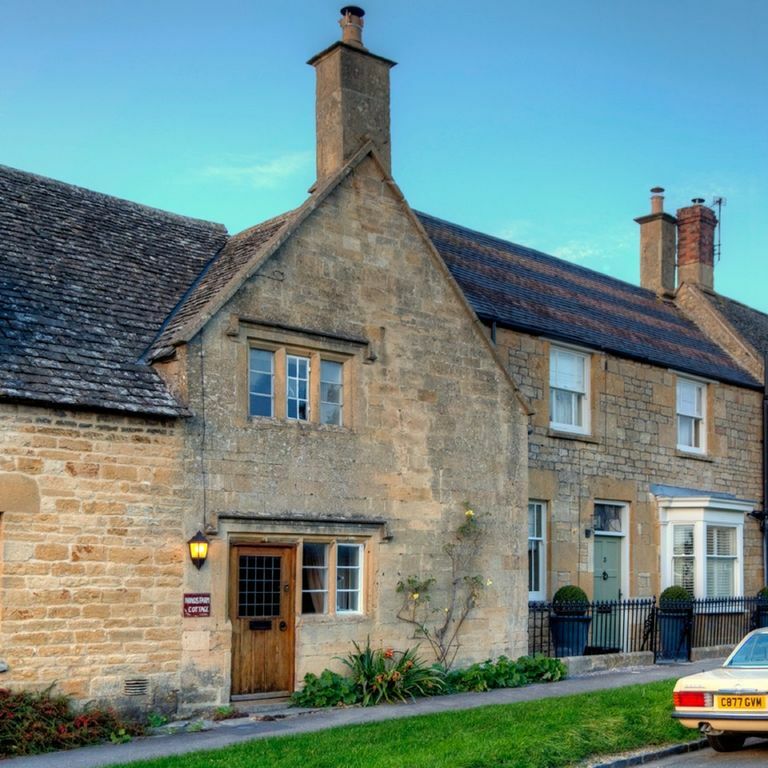 Notable restaurants are very near and include Russell's and the Lygon Arms, both in Broadway, Wesley House in Winchcombe and Buckland Manor.